Welcome back to Family bakes and makes for another week. Thank you to all the bloggers who have linked their lovely creations, I hope I’ll see you all again this week with makes inspired by the beautiful weather we’ve been having. My week has been filled with back to school tasks, baking for the preschool vintage tea party and learning to ice skate! The new linky is at the bottom of the page for anything, mixed, baked or made in the kitchen this week so please share with us after looking though the great entries from last week. The first entry this week is a great option for gluten free bakers, a Flourless Almond and Cinnamon cake made by Eileen from ET speaks from home. The cake was inspired by the flavours of Mauritius and the new cook book by Masterchef winner Shelina Permalloo. Some wonderfully golden Oat biscuits next from Alison at Dragons and Fairy Dust, made even nicer with the addition of strawberry in the form of Fruit Hero snack bars. 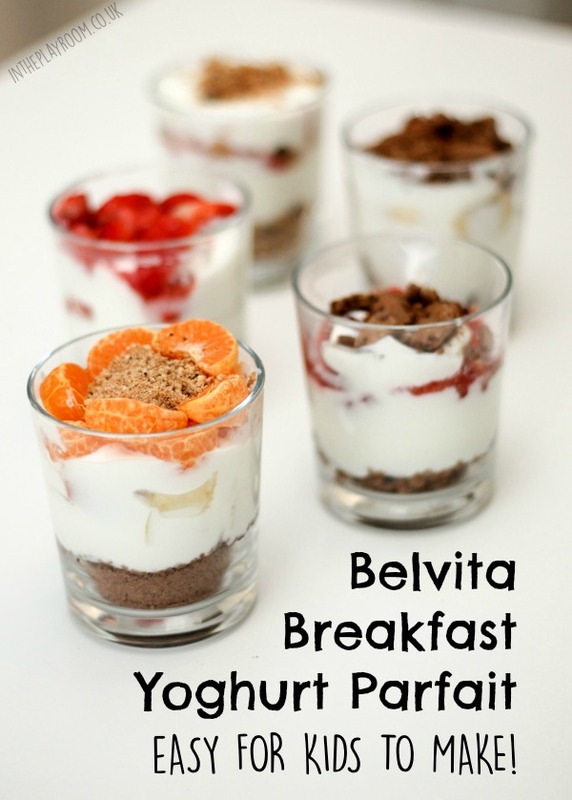 Anna from In The Playroom has a great breakfast idea that the kids can make themselves using yoghurt and Belvita breakfast biscuits which are always a great standby in our house. I love the colours and the layers although I suspect my two kiddies would be eating the ingredients well before they made anything this pretty. Marta at Petit Raisin has made the best of lemons and a rainy day by making a beautiful Lemon cake filled with lemon curd. It looks so light and delicious and perfect for sunny spring days even if on the day it was made it was raining! Herbs, Spies and Tradition is a vegetarian blog written by Sadhna who has adapted a recipe of her mother -in-law’s for Pea cutlets. I love the bright green colour of in the middle! Kerene from The Dream Baker has created a Chicken curry filled bread roll which would be perfect for picnics or lunch boxes. The idea of filled breads is one of my all-time favourites and I love experimenting with different fillings. 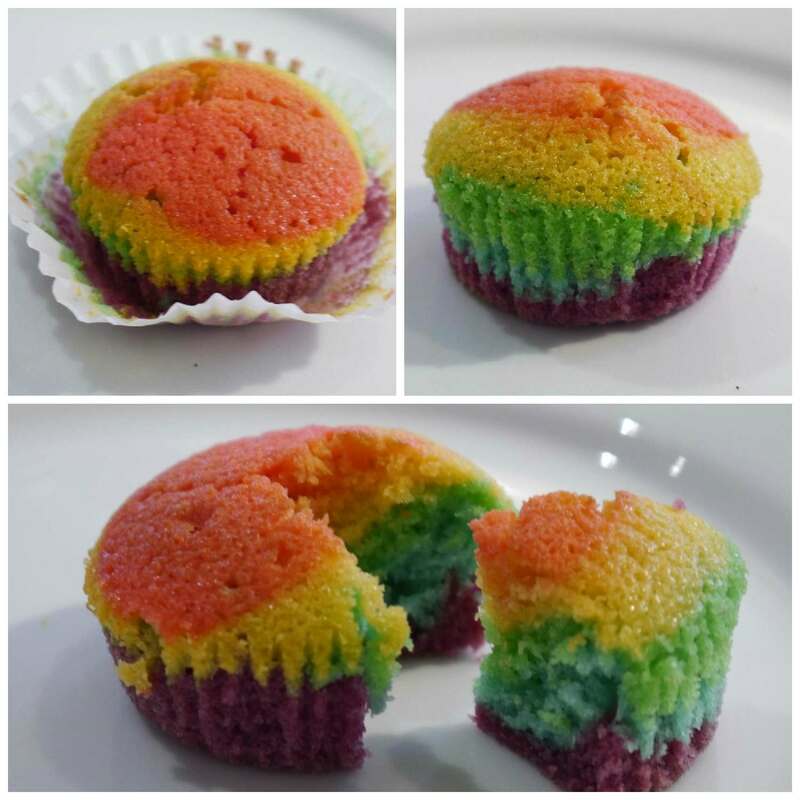 Finally these Rainbow Cupcakes are sure to brighten up any rainy afternoon stuck indoors.